While Mini’s origins were British, today it is built by BMW. It may not look like a BMW, but its sportiness and handling are very much in line with the BMW tradition. The Mini Cooper has many of BMW’s advanced mechanical and electronic design features. Some of the latest are: an electric steering pump without the use of fluid, electric water pump, and electronically controlled thermostat. These sophisticated systems operate quite differently than previous systems and require special skills and special equipment to service. At Haik’s German Autohaus, we are prepared. From the most sophisticated electronic repair to an oil change, from the difficult mechanical suspension bushing repair to a battery replacement or brake job, we have the tools, the information and the skills. All auto services and car repairs are performed by master technicians. 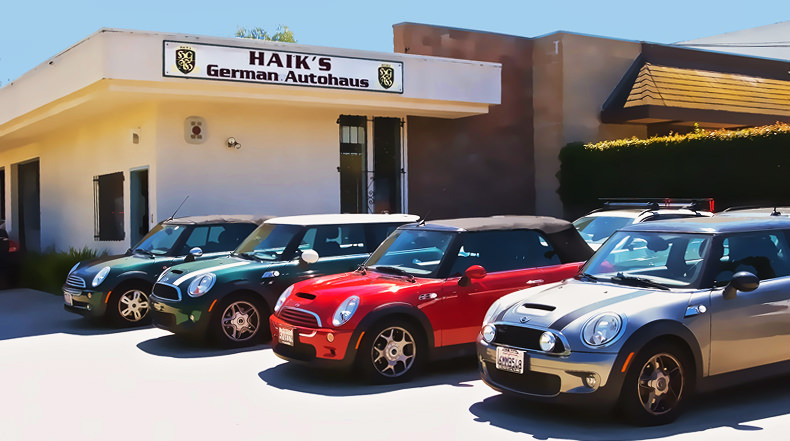 Please come by and meet us at Haik’s German Autohaus. For Mini Factory Service Schedules, see below. Basically every other service repeats with slight variations, except at 100K. At 100K, transmission fluid, oxygen sensors and spark plugs are replaced. Unlike previous service schedules, the condition based service program is not strictly time or mileage based. The CBS program uses the engine control module (computer) to monitor driving conditions and the vehicle operator’s driving habits as well. This additional information helps calculate when the next service is due. If the vehicle has been driven harder, faster, put under excessive loads, the time interval between services will be shortened and more frequent services will be needed. If the car is driven fewer miles than is considered “normal,” the time interval for the service will be lengthened. Each factor contributes to the recommended service time interval. This offers the greatest balance between cost saving and protection of the vehicle. Fuel consumption rather than fixed mileage is used as the basis on which to calculate the contamination level of the engine oil and need for an oil change, and thus a service. An oil condition sensor communicates with the engine’s ECM (engine control module) computer. The ECM processes the information with an algorithm to evaluate when the next service is due. The data is then sent to the instrument cluster to be communicated to the driver. When the service indicator warns of a service due, this does not mean the vehicle needs only an oil change however. The monitoring coincides with other service items needing to be performed at the same time. These service items have been calculated into the program to save the customer from having to return to the repair shop over and over again for each separate item. Harder driving not only causes a rise in fuel consumption and dirty engine oil, but also causes greater wear on other parts of the vehicle such as transmission, differential, tires, brakes, spark plugs, etc. These harder driving conditions shorten the service intervals, making more frequent visits to the repair shop necessary. While some service items are measured directly with sensors, many service items are not. Brake pads, micro filter, engine coolant, brake fluid, spark plugs, etc., all depend on other variables (virtual sensors) such as mileage, temperature, vehicle performance as well as other factors to indirectly measure the condition of wear and tear items. The current status of these service items can be read at any time. BMW service intervals are roughly every 15K miles. This would be considered the average or “normal” schedule. Your particular driving habits may shorten or lengthen these intervals. 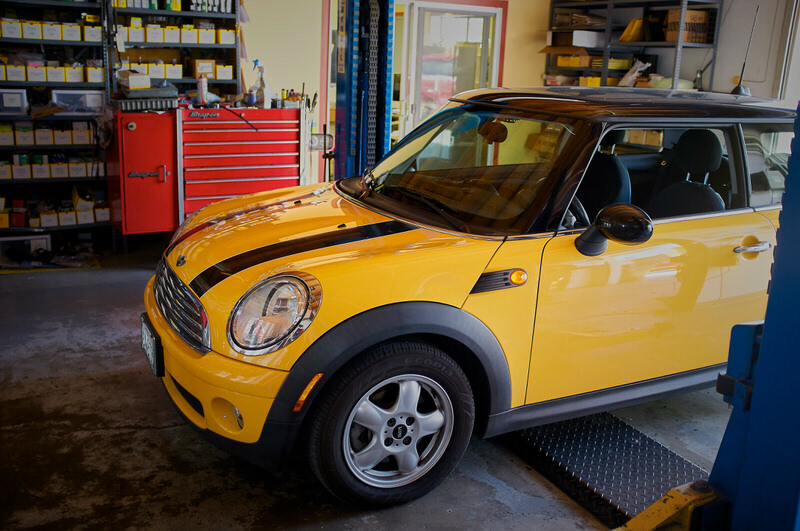 *The following Factory Service Schedule is for a 2006 Mini Cooper S. It varies slightly for every model, but is basically the same. There is not enough room here to outline every service of every Mini model. We have that information available to us on-line. Power Steering suddenly stops working. Only mechanical steering works and steering is difficult. This is on earlier models which use power steering fluid. The original Mini was built by the British Motor Corporation from 1959 to 1968. It won endurance and racing acclaim for three consecutive years British Leyland took it over from 1968-1986. The Rover Group built it from 1986-2000. BMW bought it in 2000, and it’s popularity has soared. From its origin, the car has had a variety of names Morris Mini, Morris Mini-Minor, the Austin Mini, Mini Cooper. It is now a German car built by BMW.